Being a Teen can be tough, but the Calgary Hitmen are helping; one save at a time. We have no idea who she is! 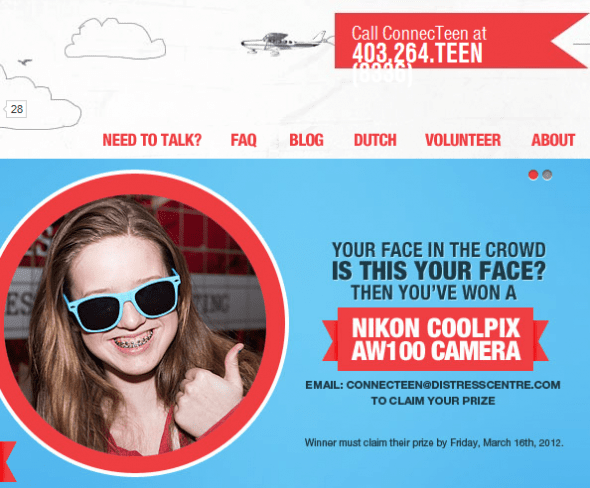 Help this girl claim her prize, a new Nikon camera donated by Nikon and The Camera Store. Please share this with everyone so we can find our winner! Learn more about ConnecTeen. Join us on Sunday March 11th 2012, 4pm at the Scotiabank Saddledome for a family friendly event; watch the top seated Calgary Hitmen face off against Red Deer Rebels and support ConnecTeen, Distress Centre’s youth peer support service. I’ll be photographing teens who participate in the “Faces in the Crowd” contest so look for me in the concourse, at centre ice and roaming through the crowd; I’ll be wearing a blue Gilmour Photography t-shirt. On Monday, March 12, tag your portraits on the Facebook page for a chance to win fabulous prizes! Follow this link for a special friends and family ticket price of $10.00 (plus applicable fees) $2.00 from every ticket purchase will support Distress Centre. · You’ll be taken to a “Calgary Distress Centre” offer page for the Calgary Hitmen vs. Red Deer Rebels game March 11, 2012. · Select the number of tickets you are seeking. Enter the promo code TEEN08 in the space to the right for your special family & friends ticket pricing. Feel free to share this invite with whomever you think would be interested. · See you at the game and thanks for supporting ConnecTeen!